When I was a child, my father and I would go and prepare the trays for communion. I remember putting in the crackers in trays, using the cup filler to fill the grape juice, and stacking the trays up to be used Sunday morning. I thought of this time as time to be with my daddy and less about something to prepare for a time with God the next day. As I got older, times with my dad grew farther apart. So any time with him was good. 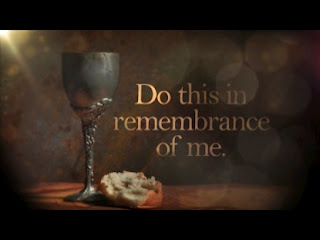 Now that I am grown, I realize communion is time with the Heavenly Father in remembrance of Christ dying on the cross for us. I now take time to dwell upon that during each Sunday's passing of the cup and bread. To realize the gift that was given so that one day I can be in Heaven with God.